Former United favourite Lee Sharpe gets behind MUST G&G Shirt project. "I'm absolutely delighted to lend my support to such a worthwhile cause - I am committed to wanting to see every MUST Green and Gold shirt sold, and I will personally be handing the £25,000 cheque over to the Prostate Cancer Charity. I can't believe the quality of these shirts, they're much better than the ones I used to wear." If you would like to kit out your child's school football team in these excellent quality shirts, please contact the office and we may be able to include further reductions. I live in the US, so shipping took more time than usual, but that's understandable. 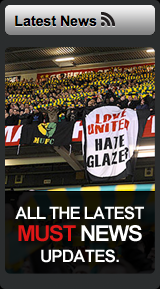 I hate the Glazer family and not many Englishmen realise that we also hate Glazer in America as well. This shirt is made of great material, better than the jersey I wear for my football (soccer) club. I wouldn't mind wearing this anywhere, it's stretchy, ventilated, and shows my support for the M.U.S.T. campaign.